My buddy Steve St. Pierre started a project called Jacket Everyday. Basically, people submit a title for whatever their life story is and Steve makes a book cover for it. Needless to say, but what an amazing idea for a project and I'm stoked that he included me in it. I love it! I recently passed the one year mark of having a separate studio from where I live. The previous 12 or 13 years had me working from home, but when my house started filling up with my children, the need for the studio increased as my work productivity decreased. It was only supposed to be until the kids were in daycare, but it quickly turned into a better situation overall so now it's a long term thing. Being able to turn off work when I leave for the day and just be Dad at home, and being more productive and more focused has been pretty invaluable. All my worries about the extra costs, or wanting to work all the time, or not being at home for every hour of every day, quickly washed away after I settled into the new routine. I highly recommend this move for anyone in a similar situation. Well just when I thought work and life couldn't get busier, I started teaching a Hand-Lettering class in the Illustration program this semester at my alma mater, Sheridan College. I have always had a bit of a soft spot for it since I had such a great experience while there and it's hard for me to imagine how different my life and career would be if not for Sheridan. I had great teachers, an invaluable internship, and graduated with some fellow illustrators who create wonderful work and continue to inspire me. I've lectured from time to time, but it's not at all in my comfort zone, mainly because it feels like I should be an extrovert in order to truly enjoy it. That said, the past few years I've learned how to work comfortably outside of my comfort zone. Or maybe my comfort zone is just larger now as a result of forcing myself to step outside of it? But, for me, teaching is worlds apart from lecturing and it feels so much more natural. I like it. I like the idea of getting to know your students, seeing them learn and grow from you, and it feels like it'll be very fulfilling. I've quickly learned what teachers mean when they say it's a very rewarding profession. I've often felt a desire to be a part of the cycle that helps the next generation of illustrators, regardless of how brief it'll be for, even if it's just for this semester. I've started wondering if my own growth as an illustrator (and/or as a person?) will be influenced from this stint, kind of like when you become a parent and you're conscious of leading by example. Anyways, I'm excited to see comes of it. Cesar Contreras over on Pencil vs Pixel interviewed me recently. It's a really great site that helps everyone get to know their favourite designers and illustrators. Well, I started writing a children's book recently. This is completely new territory for me and I'm really enjoying the challenges so far. I'll also admit that I have clue what I'm doing. I've been anxious to start expanding my work into new areas and I want to figure out what else I can bring to the table as I'm starting to feel stale in some areas. If you asked me 2 years ago if I would write & illustrate a children's book I would have said "no", but yet, here I am. It's not that I'm writing the book for my son, but it's because of him. Outside of adjusting to new routines and schedules I didn't realize fatherhood would have a direct impact on the actual artwork. This is just further evidence that supports my wife's theory that I'm equally clueless as I am astute. Either way, I'm excited about the new challenges it places on my work and it feels good knowing I may be starting a new chapter of my career. 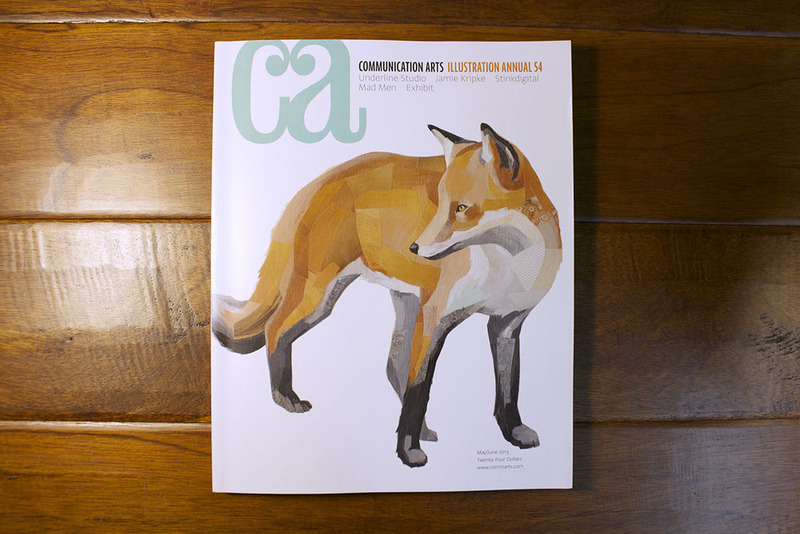 I'm pretty stoked to have my work appear on the cover of this year's Communication Arts Illustration Annual. A few more from this animal series also appear in the annual, or you can see them here and here. Commarts has been my favourite awards annual since my first year of art school and it's the only one that I submit work to every year. I do have somewhat of a love/hate relationship with many of the other industry annuals and I've expressed that in the past. Regardless of how I feel about them, having my work appear on this cover does feel pretty sweet and I'm very grateful for it. You can also find a quick interview I did with CA's Insight here. You know when you trip going up the stairs? That's what being a freelancer feels like. A school of fish, a murder of crows, a plaid of designers. Four years ago, before Cosmo passed away, I saw him in the grocery store parking lot when visiting my family at Christmas and within the first minute of chatting with him, he asked if I remembered our conversation. Up to that moment, I hadn't thought about it for eleven years, but somehow I knew exactly what he was referring to. I admitted that I didn't understand how he knew what my future held, but was thankful that he believed in me. He brushed it off, keeping it a mystery, but it meant a lot to me and it still does, especially when I'm stressed with running my own business. Very recently I've come across someone who's future I get a strong sense about, and I'm looking forward to keeping track of them for the next 11 years to see if I too, can pull a Cosmo.